This blog appearance wasn't altered since the original "defacto" blogger design was selected back in 2010 and I feel it no longer fits what I'm trying to do with this layout. As much as content is important, the container can tell us a lot about the author's attitude and can set the mood perfectly. When creating the Connors Branch blog graphic design, I found out Blogger was much more versatile than I first thought. Certainly less than WordPress, but still workable. 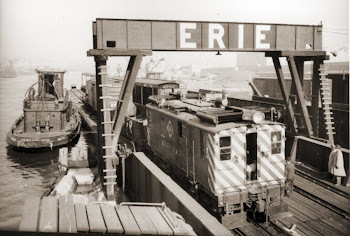 Since I've been reading old Erie Railroad Magazine (ERM) issues lately, I thought it would be a good idea to redesign the blog as if it was an old 1950s publication. I didn't had to search very far since the first page of ERM was graced by a gorgeous illustration of a pair of speeding steam and diesel locomotives. It was only a matter of changing the title and keeping the fonts as close as possible to the original ones. I certainly hope the new appearance will please the regular readers. In the near future, some additional sections such as "About The Author" and "First Time Here?" will be added quite similarly to what can be found on the Connors Branch blog. To be noted, all broken image links from my Photobucket account have been repaired. Pictures are now directly hosted on Blogger. Finally, I also started to acquire better rolling stock for the layout with the goal of ultimately replacing every blue box kits with more prototypical cars with state of the art details. This is another proof a layout is never finished, which is a good thing.